The Draper 10 x 10' Ultimate Folding Screen is unique in its design. It is manufactured with 100% CNC (Computer Numerical Controlled) components and assembly. All the included tubing is machined and cut to precision. Even the rivets and snap holes are tightly controlled during production. The Ultimate Screen is a wonderful additional to any school or business that requires a reliable and easy-to-use screen but does not want a permanent installation. The heavy duty wheeled case is made from polyethylene and is a breeze to travel with - and also provides maximum protection for the components. The system is easy to use using Draper's innovative Lock & Load latches which make set up and break down simple. These latches hold the fabric firmly in place and give the screen its rigidity. In addition, the latches are internal and designed to fill the entire tube giving them additional protection. In this way, you'll get a longer life span for the system - a real financial benefit. Couple these advantages with clear anodized 1.25 x .070" wall aluminum tubing and you've got the precision and stability that allows Draper to offer the Ultimate Folding Screen in sizes through 12x16'. The standard in portable folding screens. The Ultimate Folding Screen is the first screen manufactured with 100% CNC (Computer Numerical Controlled) components and assembly. Clear anodized 1.25" x .070 wall aluminum tubing and you've got the precision and stability that allows Draper to offer the Ultimate Folding Screen in sizes through 12' x 12'. Draper's Lock & Load latch (patent pending) is designed for ease of operation and maximum life. Lock & Load mortise latches bite down when the surface is attached, making the frame extremely rigid. The Ultimate Folding Screen comes packed in Draper's heavy duty, molded polyethylene wheeled carrying case. 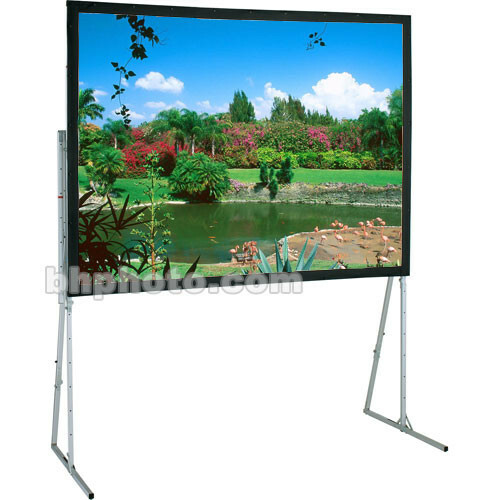 Standard Legs support the Ultimate Folding Screen in a vertical position. The screen may also be tilted for keystone elimination using the Heavy Duty Legs which offer extra stability with an adjustable gusset. Box Dimensions (LxWxH) 52.0 x 16.0 x 13.0"